The article reviews the issue of climate change and health in the Indian context. The importance of climate change leading to estimated loss of above 2.5 million DALYs in southeast Asia, mortality due to heat waves, and the importance of air quality related respiratory diseases, disasters due to excessive floods, malnutrition due to reduction in rice, maize and sorghum crops etc. Latest work undertaken in India, vis-a-vis current scenario and need for further work has been discussed. There is felt need of further studies on assessing the impact on dengue and chikungunya as the transmission dynamics of these diseases involve water availability, storage and life style, etc. Uncertainties and knowledge gaps identified in the studies undertaken so far have also been highlighted. As regards to vector borne diseases, there is a need to concentrate in the areas which are presently free from malaria and with use of best available tools of interventions in already disease endemic areas like northeastern states, the risk of climate change impacts can be minimized. Background & objectives: Malaria resurgence in highland regions of East Africa has been on increase. The spatio-temporal distribution of larval habitats of malaria vectors determines the distribution of adult vectors, hence, disease transmission. Vector's ecology is necessary for strategic vector control through effective plan for source reduction. Mapping of the larval habitats is necessary for targeted control measures. The purpose of this study is to assess and compare the spatial and seasonal variations in anopheline larval habitats in Western Kenya. Methods: A comparative study was conducted on spatial distribution of GPS geo-located anopheline larval habitats in relation to highland and lowland environments. Land use types were categorized and all potential aquatic habitats of malaria vectors were examined in February, May, August and November 2004. Data analyses were performed using SAS JMP software. Results & discussion: Results showed a higher percentage of Anopheles gambiae s.s. (70.9%) than An. funestus (29.1%) in highland. In the lowland, An. gambiae s.l. comprised 60.1% while An. funestus represented 39.9%. The distribution of larval breeding is confined to the valley bottom in the highland while it was dispersed in the lowland. Land use type influenced the occurrence of positive breeding habitats in the highland. In the lowland, distribution was due to seasonality. We found high proportion of potential and positive breeding sites in cultivated swamps and farmlands at the highland site. These results suggest that swamp cultivation increases the availability and suitability of larval breeding habitats of malaria vectors, thus malaria transmission in the Western Kenya highlands environment. Background & objectives: Homeopathy is considered as an emerging area of alternative medicine which could be established for the global health care. One of the greatest objections to this science lies in its inability to explain the mechanism of action of the micro doses based on scientific experiments and proofs. The present study has been undertaken to screen in vivo antimalarial activity of Malaria Co Nosode 30 and Nosode 200 against Plasmodium berghei infection in BALB/c mice. Methods: Peter's 4-day test was used to evaluate the in vivo schizontocidal effect of Nosode 30 and Nosode 200. One month follow-up study was done to calculate the mean survival time of mice in each group. Biochemical analysis was carried out to assess the liver and kidney function tests using diagnostic kits. Results: Nosode 30 and 200 exhibited 87.02 and 37.97% chemosuppression on Day 7 and mean survival time (MST) of 18.5 ± 2.16 and 16.5 ± 1.37 days respectively, which were extremely statistically significant when compared to MST of infected control (8.55 ± 0.83 days). The safety of Nosode 30 was also confirmed by the comparable levels of ALP, SGOT, SGPT activities, concentration of bilirubin, urea and creatinine to CQ treated group. Conclusion: Nosode 30 possesses considerable in vivo antiplasmodial activity against P. berghei infection as compared to Nosode 200 as evident from the chemosuppression obtained using Peter's 4-day test. Further, studies on the drug can be carried out to establish its antimalarial potential in monotherapy or in combination with other homeopathic drug formulations. Background & objectives: Literature reports several studies on ABO groups and malaria but a study with an adequate sample size and controls is not available. ABO groups are genetically controlled, hence, large sample size and comparison with population frequency is essential. To determine whether malaria infection with variable severity has correlation with ABO groups. Study design & Methods: Blood samples of non-transfused malaria cases were obtained from pathology laboratories and transfused malaria patients' from Blood Bank. The malaria parasites were identified by examination of thick and thin smears. Control (normal population) included 11,303 students. Results: The ABO group frequency of normal population was ‘O’ 32.3%, ‘A’ 22.2%, ‘B’ 36.7% and ‘AB’ 8.8%. The overall ABO group distribution in 8028 malaria cases was ‘O’ 30%, ‘A’ 24.6%, ‘B’ 35.5% and ‘AB’ 8.9%. ‘A’ group incidence was significantly higher than normal (‘A’ vs non-‘A’ χ2 = 15, df=1, p <0.001). ABO group frequencies were comparable within Plasmodium falciparum and P. vivax malaria. There was no significant difference in ABO group distribution in malaria patients having severe anemia or among transfused and nontransfused malaria cases. About 32% of P. falciparum cerebral malaria cases and 36% DIC cases were of ‘A’ group. Compared to 22.2% ‘A’ group in the population, malaria cases showed preponderance of ‘A’ group. Because of the small numbers statistical evaluation was not done. Conclusion: ‘A’ blood group is more susceptible to have malaria infection and risk of cerebral malaria and DIC in malaria is also more in ‘A’ group individuals. Background: Delhi, a city in north India, has so far witnessed several reported outbreaks of dengue. Dengue in Delhi from being epidemic is slowly changing towards being endemic and hyper-endemic. Circulating type of the virus is also changing over the years. In the absence of an effective vaccine, dengue prevention to a major extent relies on virological surveillance, and development of effective, locally adapted control programmes. In the present study, we tried to identify the between-year non-epidemic serotype of dengue virus circulating in Delhi, during 2010–11. Methods: Acute-phase samples were collected from the patients attending the Institute of Liver & Biliary Sciences, New Delhi, India. Dengue diagnosis was done using WHO case definitions. All the samples were subjected to Dengue NS1 Ag ELISA and modified nested RT-PCR. Results: A total of 75 acute-phase samples were received, of which 19 (25.3%) were positive for dengue NS1 antigen. Dengue RT-PCR was positive in 14.6% (11/75) samples. All the RT-PCR isolates were of DENV-1 serotype. No case of concomitant infection with more than one serotype was observed. Median age of involvement was 23 yr (range10–86). Maximum number of cases were seen in the age group of 21–30 yr. Male to female ratio was 1.2 : 1. Maximum number of suspected dengue cases (n=79) was seen during September and October. Conclusions: DENV-1 was circulating in Delhi in the year 2010–11 in non-epidemic period following reported predominance of DENV-3 and co-circulation of all dengue serotypes in the epidemic years 2003, 2006 and 2007. Background & objectives: Development of plant-based alternative compounds for mosquito control has gained importance now-a-days, in view of increasing resistance in mosquito vectors to existing insecticides. The larvicidal and repellent activities of benzene, chloroform, hexane and methanol leaf extracts of Indian medicinal plant, Adansonia digitata were investigated against malarial vector, Anopheles stephensi. Methods: In all, 25 III instar larvae of An. stephensi were exposed to various concentrations (30–180 mg/l) in the laboratory by using the standard protocol described by WHO (2005). The larvae were exposed for 24 h and mortalities were subjected to log-probit analysis. 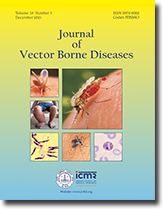 Repellent activity of crude leaf extract at the dosages of 2, 4 and 6 mg/cm2 was evaluated in a net cage (45 × 30 × 45 cm) containing 100 blood starved female mosquitoes of An. stephensi using the protocol of WHO (1996). Results: Preliminary phytochemical analysis of A. digitata showed the presence of triterpenoids and saponins. The LC50 and LC90 values of hexane, benzene, chloroform, and methanol extracts of A. digitata against An. stephensi larvae in 24 h were 111.32, 97.13, 88.55, 78.18 and 178.63, 176.19, 168.14, 155.42 mg/l, respectively. The repellent activity of methanol extract was found to be most effective and at higher concentration of 6 mg/cm2 benzene, chloroform hexane and methanol extracts provided 100% protection up to 150, 180, 120 and 210 min against An. stephensi, respectively. Conclusion: The preliminary study indicated that A. digitata showed larvicidal and repellent activities against An. stephensi and could be used for controlling mosquitoes. Further studies are indicated to purify the active compounds from these plants for developing larvicide and repellents. Background & objectives: Malaria is the most important mosquito-borne disease in Iran. It is endemic in south to southeastern part of the country. Knowledge about bio-ecology of vectors will support authorities for appropriate management of the disease. Bashagard district is one of the main endemic areas for malaria in south of Iran. This study was conducted to determine anopheline fauna, diversity and affinity in the area, characterization of larval habitats, and mapping their potential distribution across the district. Methods: The potential aquatic habitats for Anopheles larvae were extracted from Indian Remote Sensing Satellite (IRS) image and digital elevation model of the area using GIS. Surface water bodies were sampled monthly during 2009–10 for anopheline larvae, while characteristics of their physical environment were recorded and water samples were analyzed. Results: A total of 4511 Anopheles larvae were found during the year with the lowest and highest frequencies in February and April, respectively. Dominant species was Anopheles culicifacies. The Shanon diversity index ranged from 0.570–0.829 at fixed collection sites, while the affinity index was significant among some vector species. Conclusion: Riversides and riverbeds were the main breeding places which provided sandy, rocky, and clay beds for different species. The potential breeding places as well as distribution of collected species were mapped. Knowledge about ecology of malaria vectors provides information to health sector for effective control programs. Background & objective: Epidemiological studies were carried out to assess the prevalence and community microfilarial load (CMFL) of onchocerciasis after repeated annual treatment with ivermectin along Ogun river System, southwest Nigeria. Method: Skin snips were taken from consented participants in 11 selected communities along the River system. The microfilarial load of the community was estimated. Results: The prevalence and CMFL varied significantly in the communities (p <0.05). The prevalence of onchocerciasis ranged from 19.1 to 45.6%, while the CMFL ranged from 0.11 to 1.03 microfilariae per skin snip. The CMFL recorded was <5 microfilariae per skin snip, i.e. recognized by WHO as threshold value in certifying the communities to be free of onchocerciasis as public health problem, thus, signifying the possibility of onchocerciasis elimination in the study area. Conclusion: Efforts should therefore be intensified to achieve improved ivermectin coverage and compliance in annual ivermectin treatment in order to completely eliminate onchocerciasis as a public health problem in the studied communities. Background & objectives: We have established a severity grading score (SGS) system for predicting the fatality in Crimean-Congo hemorrhagic fever (CCHF) for the first time. Methods: This SGS has been set up by using several variables which were assumed to be associated with mortality according to the literature and also were considered to have clinical importance. Results: In all, 237 patients who had symptoms of CCHF for ≤5 days were included. The patients were grouped into three categories according to the mortality risk by using SGS as follows : low or no risk, intermediate and high risk groups. A SGS ≤5 showed no association with mortality (there were 158 cases in this group and all survived). This group constituted 66.7% of all the patients with CCHF. A SGS 6–10 showed moderate risk of mortality (10%) and seven out of 70 patients in this group died. SGS ≥11 means high risk for mortality (67%) and six out of 9 patients in this group died (p = 0.001). The sensitivity, specificity, accuracy, positive predictive value, and negative predictive value for ≥11 points of SGS were 67, 100, 98, 100, and 98%, respectively. Conclusions: This scoring system may help the clinicians to decide which patient to refer to a tertiary step hospital which may also decrease the cost and improve the functionality of healthcare staff.